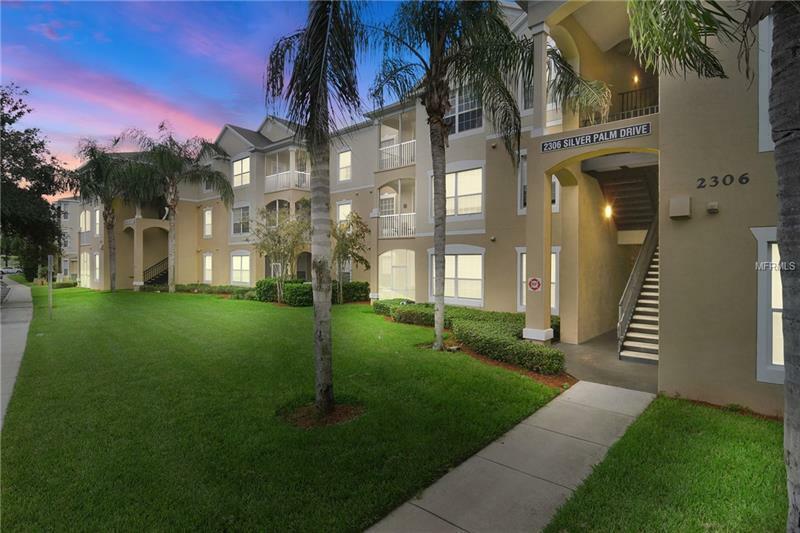 One of the nicest units we've seen in Windsor Palms, this third-floor condo with a gorgeous conservation view is a "must see!" Fully furnished with upscale decor, wall-mounted flat screen TVs and updated lighting fixtures, it has been wonderfully maintained by the original owners. The location offers an expansive, wooded conservation view, perfect for enjoying gorgeous Central Florida sunsets. Features include an open family room and dining room combination with lots of natural light, a split floor plan, dual master bedrooms with spacious walk-in closets, fully stocked kitchen, laundry closet with washer and dryer, and a screened lanai. Ceramic tile and laminate wood flooring throughout! A/C system was replaced in 2016 and refrigerator in 2018. Windsor Palms is a guard gated community with resort-style amenities that include a clubhouse with large salt water pool and spa, splash pad, fitness center, tennis courts, playground, game room, 58-seat movie theater, sundry shop, tiki bar, community-wide WiFi, and much more. Located approximately 4 miles from Walt Disney World. This property may be rented short term or long term, and currently has short-term bookings through May 2019. If you're searching for the perfect vacation home or investment property, this condominium should be at the top of your list!